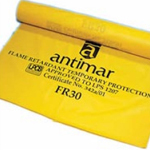 Antimar FR30 is a high quality floor protection film which ticks all the boxes. This professional product is used by blue chip companies accross the UK. © 2019 Rip 'n Grip, all rights reserved worldwide.